Kid-friendly features and a striking vaulted ceiling make this Medfield family’s kitchen addition both sensible and easy on the eye. NEW HEIGHTS The homeowners splurged on a lofty wood-clad ceiling that creates an open, airy feel. Most of the classic white cabinets were kept low, leaving room for plenty of windows. TRACEY ROGERS LOVED her Medfield home, but she hated her kitchen. Part of a great room, the galley kitchen was small and dated and hugely inefficient for a family of five. Rogers and her husband, Gordon Johnson, dreamed of a kitchen with its own defined space that would accommodate their family’s needs today and when their three children, who are now 7, 11, and 13, get older. It was essential to Rogers that the kitchen be light-filled and inviting, so Sharff gave the room a 12-foot-high vaulted, painted- wood ceiling and numerous windows. 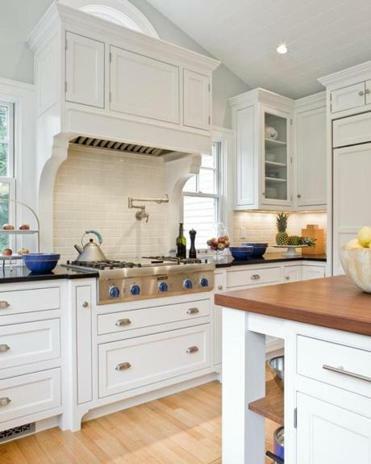 To enhance the room’s bright, airy appeal, Rogers selected white cabinetry with a clean, classic look crafted by Gary Whitehouse of Walpole-based J&M/Creative Cabinet. Sharff kept the upper cabinets to a minimum to prevent the room from feeling too heavy and allow for more windows. And it scores on chores. “The kids’ plates and cups are stored in the island,” says Rogers, “so they can empty the dishwasher and put their stuff away easily.” The island’s easy-to-reach built-in microwave drawer lets the kids participate in meal preparation. Counters are honed absolute black granite, and the island is topped with teak – another unusual choice that gives the room character. The space that was the galley kitchen became a mudroom. The dining table, complete with bright blue wooden chairs, is located in the great room, which is connected to the new kitchen by a transom that Sharff designed. “The room is both realistic and beautiful,” says Rogers, who is confident that her kitchen will suit her family for a long, long time. WHAT APPLIANCES ARE BEST FOR YOU? The number of stoves, ovens, refrigerators, dishwashers, etc. available today is immense. “There is so much variety in terms of function and cost, it can take a lot of time to research appliances,” says Sharff. “It’s not just about what looks good; the models you choose can dictate how a kitchen comes together from a technical perspective.” For example, commercial-grade cooktops require elaborate exhaust systems that need to be accounted for well in advance of construction. Jaci Conry is a writer and editor on Cape Cod. Send comments to magazine@globe.com.